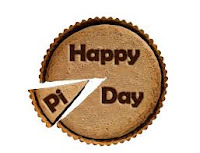 March 14 is a fun day for math enthusiasts who celebrate Pi (3.1416 - if you round up)! Trying to calculate the area of a circle? The circumference? You'll need Pi for those calculations. The admissions office at MIT is famous for handing out decisions on Pi day. Did you also know that 3.14 is Albert Einstein’s birthday? Celebrate Pi Day with a piece of pie!